Last week I posted a brief evolution of the Emmie art, from sketches to finished book illustrations. This week, I thought I’d do the same for the Katie art. 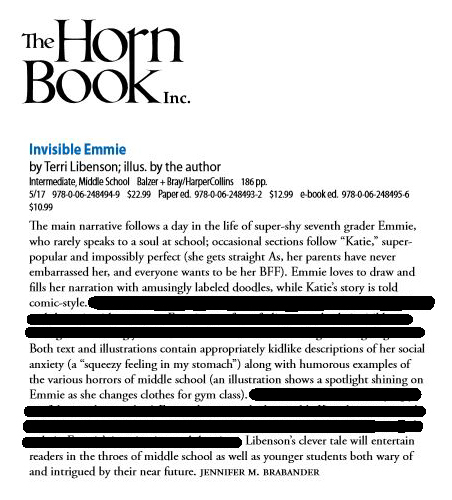 If you’ve read (or peeked through) Invisible Emmie, you’ve seen that the Emmie and Katie chapters are stylistically different. 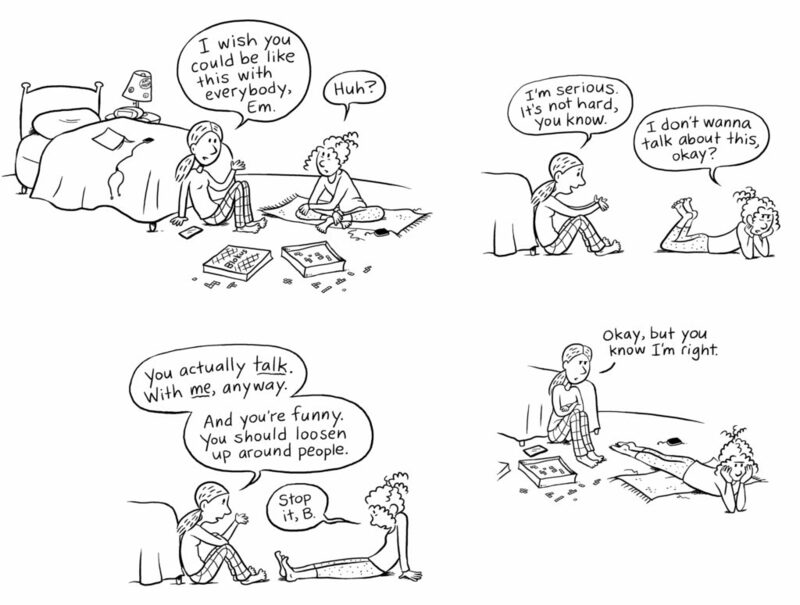 Emmie’s chapters are told in prose with spot art, while Katie’s are graphic novel-style. 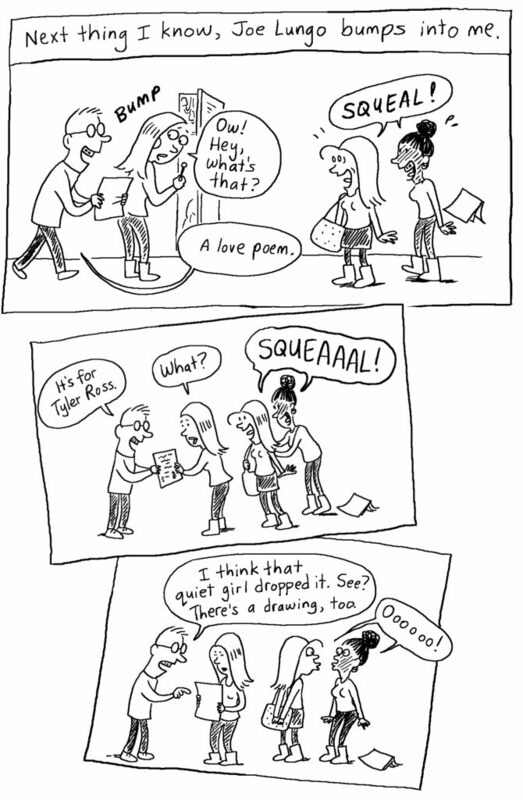 Using an example from page 86, here’s a little explanation of how the Katie chapters came to life. First, just like with the Emmie art, I started with a sketch on simple computer paper. Next, I deleted the template layer. Much better! Finally, I colored in the line drawing, which was fun because I was able to use bright, vibrant colors…a little different than the muted tones of the Emmie art. And voila! A finished page. I enjoyed switching off between Emmie and Katie chapters simply because it kept me from getting bored with one or the other. 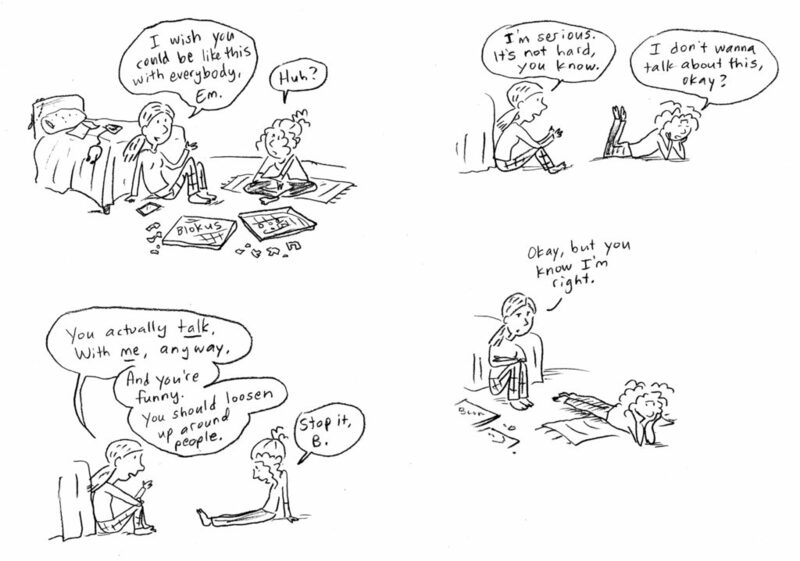 And now that I have the process down, it’s time to move on to book 2…which, by the way, has MUCH more art. Wish me luck! 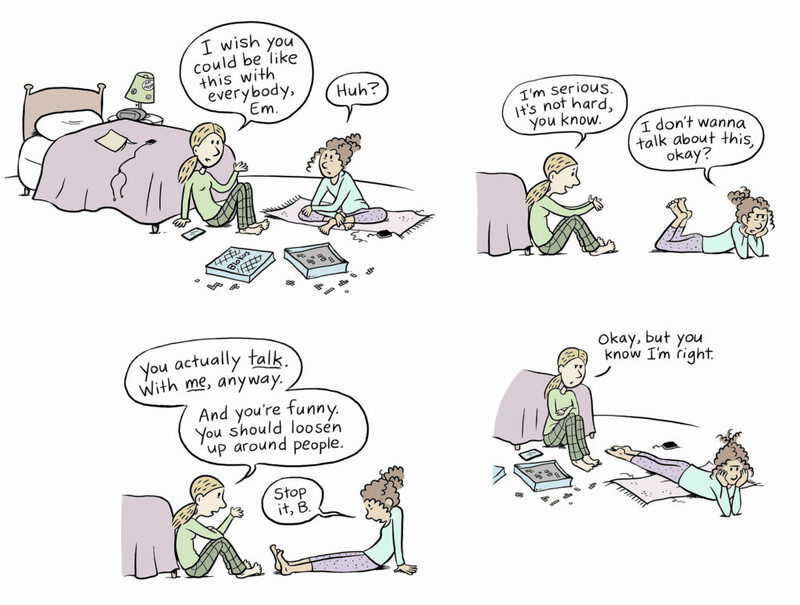 Clevelanders: I’ll be signing “Pajama Diaries” and “Invisible Emmie” books Saturday, July 1 from 12-4 pm as part of Loganberry Books’ Author Alley event. This event is also part of the annual Larchmere Festival in Shaker Hts. Hope to see you! 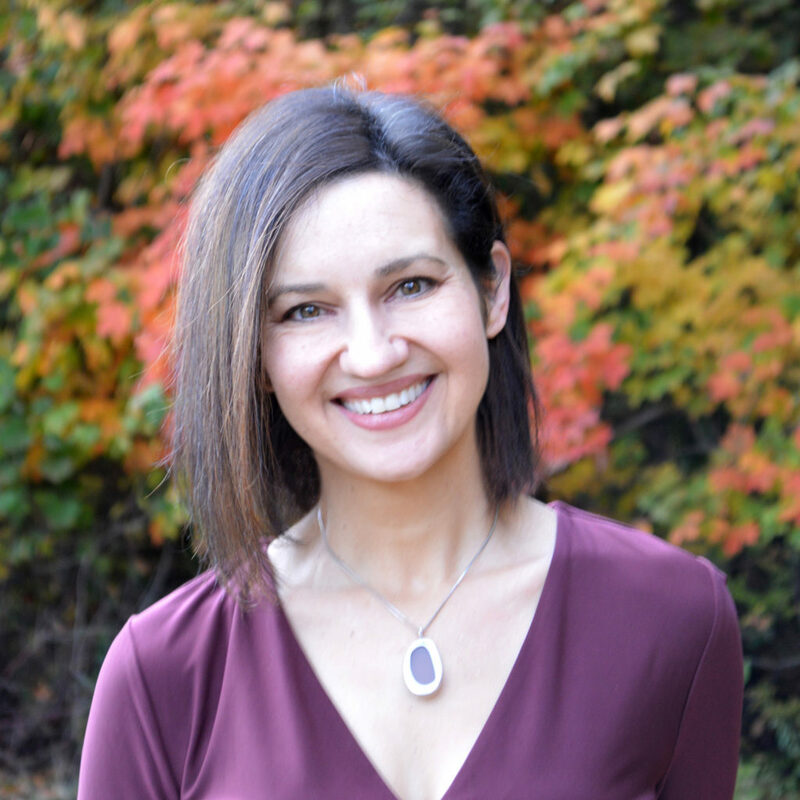 Here’s a really nice interview about Invisible Emmie with author, editor, and blogger, Deborah Kalb. Very nice review by Horn Book. Had to censor part of it due to spoilers, but pretty cool! 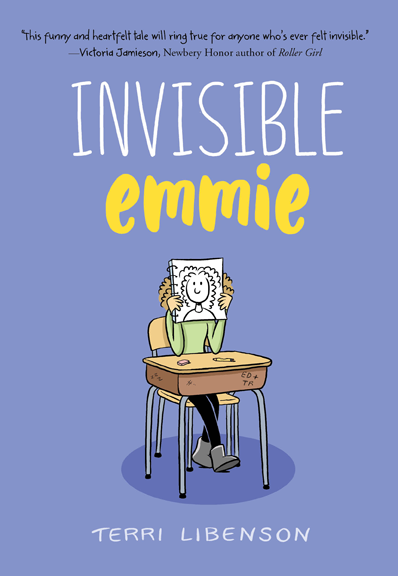 On Tuesday, June 13, I’ll be signing copies of Invisible Emmie at the Crocker Park Barnes & Noble in Westlake, OH from 11 am – 1 pm. Hope to see you there! More info here. Locals! I have another book signing event coming up. I’ll be at Appletree Books in Cleveland Hts on Thurs, June 1, from 7-8 pm. Great bookstore, great location (stop by after you chow down at Vero or Barrio). 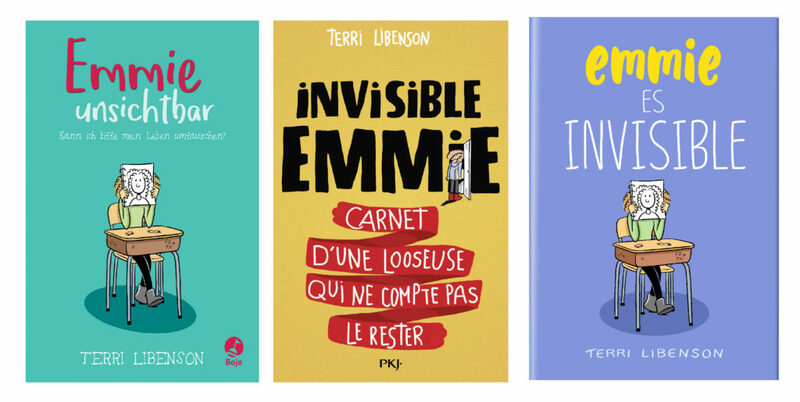 Buy a copy of Invisible Emmie, or bring one you’ve already purchased. Hope to see you there! 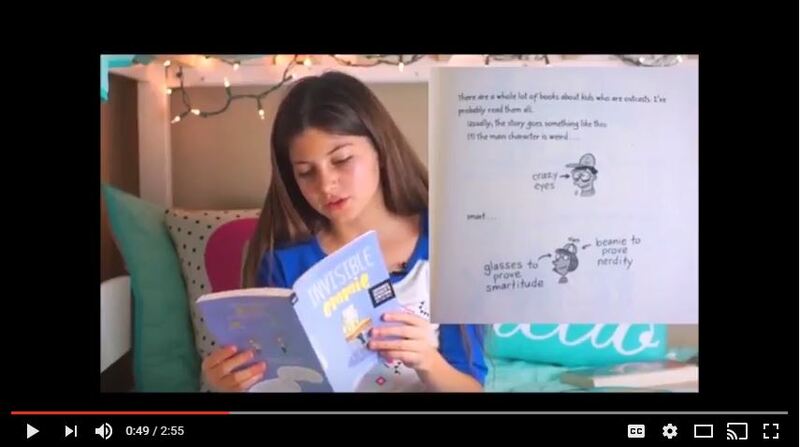 I just had to add this heartwarming video review by a wonderful young vlogger named Brooke. She made me tear up! This is a condensed version only showing her IE review (of the advance copy, which is in black & white). There is also a link on the site for the entire video. I’m hitting the road for an Invisible Emmie book tour next week! And because I love the midwest, that’s where I’ll be. 10 presentations in 5 days! I’m trying not to think too hard about the math. I’ll be speaking at middle and elementary schools in Cincinnati, OH, Mount Vernon, OH, and Kalamazoo, MI. Then it’s back to Cleveland for the launch party & signing. There is one public speaking event at the Bookbug bookstore in Kalamazoo, MI, so if you Michiganians (and your friends/families) can make it there, I’d love to see you.